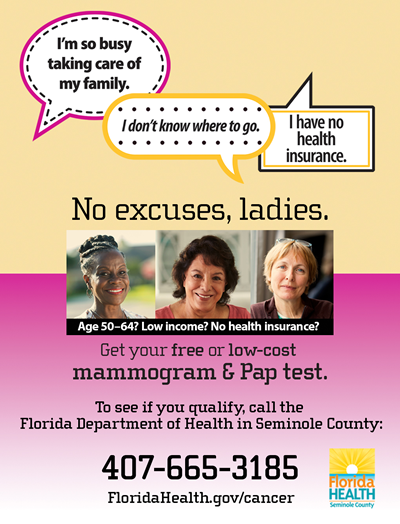 Want a free Mammogram? Call 407-665-3185 or 407-665-3244 today to schedule an appointment. Breast cancer is the most common cancer among American women. Cervical cancer is highly preventable in most Western countries because of preventative care. Taking preventative measures on a regular basis can lower your risk of dying from breast cancer. The Breast & Cervical Cancer Early Detection Program at the Florida Department of Health in Seminole County is here to educate and raise awareness about breast and cervical cancer through community education and outreach, early detection, and treatment, and to reduce the number of deaths from breast and cervical cancer. We offer affordable payment options for our patients who qualify under the Federal Poverty Level, and are uninsured or underinsured. If you have private health insurance (not Florida Medicaid) we recommend you see your selected primary care physician. The Breast and Cervical Cancer Early Detection Program proudly supports the National Breast Cancer Awareness Month’s efforts to educate women on the importance of yearly physicals. The campaign is held every October.